Well it depends on what you're trying to achieve. Some sites are better for art, some for graphics and some don't show videos. Behance is the biggest and also the most popular portfolio platform. Organize your work in folders to create an organized portfolio. Grouping members as illustrators, designers, painters, and photographers allows companies to easily search. Members may also take advantage of the job board and sell their work. Dribbble is show and tell for designers. In other words it's great for networking, showing of and discussing your work and networking with like-minded creatives. Upload your work as (shots) and get votes and shares from other designers. Dribble also has a job board, so it's a great place for people to discover, follow, and hire designers. Easy to use, with no HTML knowledge necessary, just drag and drop to organize images. Display limited projects and images for Free or much more via the paid plan. Great if you want to set up something small but perfectly formed. Built for designers by designers Coroflot is Free and unlimited. Coroflot is a great place to gain exposure and connect with job opportunities. Includes a job board and easy portfolio creation, you can craft your URL and develop a personal profile. You can also subscribe to job alerts, follow other designers and get notified of their new projects. Join the World’s largest community of artists and art lovers. With 28 million members and millions of page views per month, if your work is less commercial in nature DeviantArt could be for you. You don't need any coding skills to set up a profile and create galleries of your work. At its best DeviantArt allows you to communicate and collaborate with artists around the globe. You can even sell your work. Flikr is seen as a photo sharing and management application. It’s a bit limited but still a great option for videographers and photographers. Create a Profile and Groups and place your images in front of the right people. Build your portfolio in your browser with drag and drop functionality. Free option allows for 50 Images / 10 products and 10 pages. But you lose the Pro template after 30 days if you don't pay up. Portfoliobox goes beyond the basic portfolio; add a blog, a gallery or even an e-commerce store. 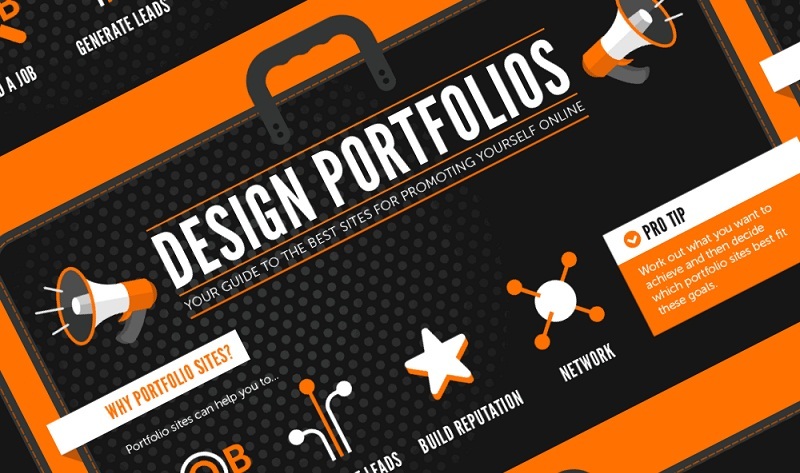 Build a professional portfolio and share your work with respected brand around the world. The free version is limited to just your resume and 10 images. It's quick to launch so you can spend your time promoting your portfolio not designing it. Dunked is paid only with no Free options. The plus side is that it's powerful, low maintenance, easy to use, with amazing functionality. Ideal if you want to display diverse range of media from literary works to illustrations to videos and even audio clips. If you’re not worried about being part of a design community consider Wordpress.com. There are 90+ portfolio themes available, plus a bunch of plugins. You don't even need to worry about hosting, security, domain names, or backups. Tumblr is a microblogging platform and social networking site. But you can also get free portfolio themes. The good thing is that it's great for sharing. You can share content using chat, audio, video, text, photos and quotes and get others to push your content.